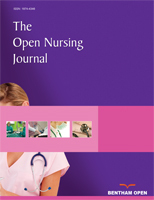 The Open Nursing Journal is an Open Access online journal, which publishes research articles, reviews/mini-reviews, letters and guest edited thematic issues in all areas of nursing. The Open Nursing Journal, a peer-reviewed journal, is an important and reliable source of current information on developments in the field. The emphasis will be on publishing quality papers rapidly and freely available to researchers worldwide. All authors should make clear how the implications of their paper for nursing, midwifery and health care practice. They should also clearly identify the ‘take home message’ from their paper.